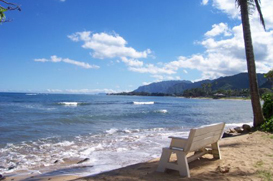 Located 26 miles from the bustling nightlife and fast-paced culture of Honolulu, Oahu’s North Shore feels a world away. As part of the north-facing coastal area of the island, between Ka?ena Point and Kahuku Point, it is home to some of the largest waves on earth, attracting surfers worldwide. Notable surfing spots on the North Shore include Waimea Bay and Sunset Beach, and the winter months are when the surf is the highest.